Having never seen Eugene O’Neill’s The Moon for the Misbegotten before, I should not feel as confident as I do asserting that the current production at The Pearl is a reinterpretation. I don’t mean in a “let’s changed the ethnicity of the cast” or “let’s insert incongruous devices” or “let’s see how much technology we can use” kind of reinterpretation. Instead I suspect that director J.R. Sullivan chose to tell the story in a new way through casting. This (excellent) cast is both physically and spiritually slightly against type. 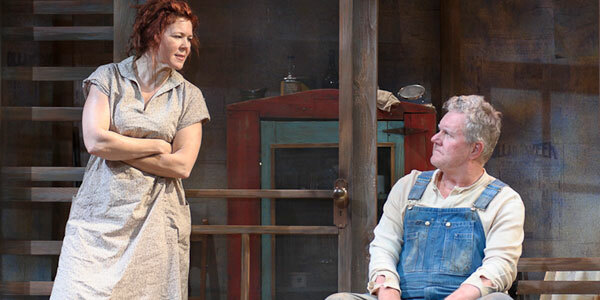 At first glimpse Josie (Kim Martin-Cotten) is a lumbering, smudged and bedraggled farmwoman. She shifts her center of gravity down and splays her legs as she barrels across the stage. But when she slows down and we get a good look, she’s quite lovely. Perhaps, when this play was originally produced (1947) she might be considered a bigger woman, but by today’s standards she has an enviable figure. Much of the play is centered around her insecurities in her appearance. By casting a woman as classically pretty as Ms. Martin-Cotten this device seems quite modern. Her struggle seems all the more real because of its psychological origins. Her father Phil (Dan Daily) is a large barrel chested man who could be a distant relative to Alan Hale (Sr. or Jr.) He has an affability that belies his lot in life. We know from an early conversation between Josie and her fleeing brother Mike (Sean McNall) that daddy can be bombastic. Dan Daily’s Phil seems more Captain Kangaroo than that which adds another layer of psychological realism. The adult children experience him in a manner that is theirs alone. Jame Tyrone Jr. (Andrew May) is Long Day’s Journey Into Night’s Jamie all grown up. For anyone who’s ever wondered about the effects of addicts raising children, I give you Jimmy. Mr. May plays Jimmy as a loving and softhearted man with a dark demon deep within. He presents himself as so socially endearing that his excessive drinking is the only hint of what lies beneath. Until the earth opens and swallows him. This nuanced performance is so realistically accurate. The tormented and deeply tortured rarely advertise their condition. The theatre (City Center’s Stage 2) adds yet another key ingredient to this production. A small thrust theatre, with the audience practically on the stage, sustains connectivity for the 3 1/2 hour(!) play. There is much, of course, that is heart wrenching about this play, but there is much that is very very funny as well. It is by nature a very heavy play but this production feels fresh and very relevant as well. There was a girl of about 10, sitting next to me. She sat stock-still and transfixed throughout the entire production. As did I.